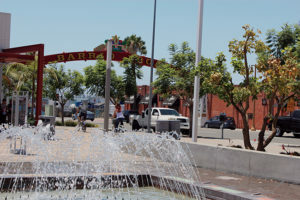 Only two decades ago, the Barrio Logan neighborhood, just on the east side of the Coronado Bridge, wasn’t quite the bustling enclave of art galleries, music and food that it’s become today. 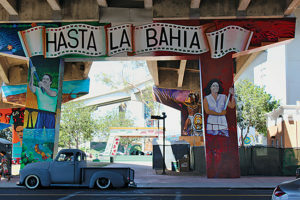 Since the early 1970s, vibrant murals have adorned the bridge’s pillars in Chicano Park (now a National Historic Landmark), telling a story of activism and triumph and paying homage to the neighborhood’s rich Hispanic heritage. But the streets surrounding those colorful pillars are, as of recent years, bursting with new life, and the neighborhood is now a destination for its notable gallery scene and authentic eateries. Still, even with this influx, the neighborhood is staunchly committed to staying true to its roots of culture and public art. Bread & Salt is one collective art space that captures the creative, community-centered vibe of the Barrio. Located in an enormous warehouse that operated as a bread factory from 1896 to 2006, the space occupies half a city block and is separated into large, open exhibit spaces, where local artists showcase a dynamic array of works. Thomas DeMello, the gallery’s curator and manager, explained that the gallery’s name was partially derived from its building’s history, but the word “salt” was added as a subtle allusion to decent, “salt of the earth” people. “We would never charge for an art exhibit,” said DeMello. “The vision here was being a community-based arts building accessible to the public.” The gallery hosts a number of art lectures, exhibits, and community events, all of which are free. Brett Stampf and John Bull opened Alta Brewery within the bread warehouse in August. “We’re part of an art space, and the truth is that making good beer is an art in itself,” said Stampf. 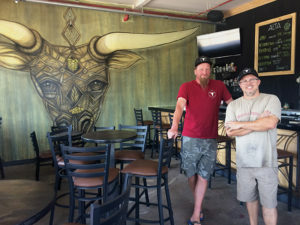 The duo hired Mexicali artist Gloria Muriel to paint a wall-size mural of a horned bull (their mascot), and chose the name “Alta” because it means “above and beyond” in Spanish. Both choices show the dedication to stay true to the roots of their new neighborhood. “So many breweries in San Diego now operate out of industrial parks. But we get to be in the middle of so much art and culture. That’s cool,” said Bull. Though eyes began turning to the Barrio a few years ago, it seems to have hit a critical mass as of late. “We really started seeing a boom of new business about two years ago in 2015,” said Chris Zertuche, who owns the popular La Bodega Gallery on Logan Avenue, which opened in October 2013. “But now I see new businesses open every month, from art supply stores to tamale shops to vintage clothing to hair salons. 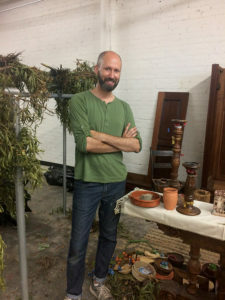 Logan Avenue has become a really exciting place,” he said. Zertuche’s gallery inhabits a warehouse built in 1917; the building was a Bank of Italy during the 1920s (the vault is still part of the gallery). Today, it’s an open space where anywhere from 40 to 100 local and international artists display their work. The gallery hosts rotating shows every weekend, featuring all different mediums, and open mic nights for poetry readings. Lorenzana is a member of the Logan Avenue Consortium, which is dedicated to promoting businesses and events along its namesake street. The consortium runs the Barrio Art Crawl, which takes place the second Saturday of every month. Galleries, restaurants and businesses host special exhibits and events throughout the day for those eager to explore the burgeoning arts scene. The event demonstrates just how cool this enclave has become — art enthusiasts of all ages meander along the streets and hop in and out of brightly lit and inviting storefronts; art galleries are filled to capacity. The energy and buzz are undeniable. With so much to explore in the Barrio, sustenance is a must. Ryan Brothers Coffee has been a neighborhood staple since it opened on Main Street in 2003. The family-run business took a chance on the area back then; the warm, brick interior of their bustling café and roastery remains a mecca for caffeine lovers. Newer to the block is Café Moto. The roasters provide sustainably farmed coffees and teas to establishments all over San Diego. Their café on National Avenue, also tucked inside an old warehouse, is decorated with reclaimed wood walls and contemporary motorcycle art and serves up delicious coffee specialties. For a different type of buzz, try the Mexican craft beers at Border X Brewing on Logan Avenue. Their Horchata Golden Stout is brewed with whole cinnamon sticks and vanilla bean, and their Blood Saison is inspired by the traditional Mexican drink jamaica and made with real hibiscus and agave. 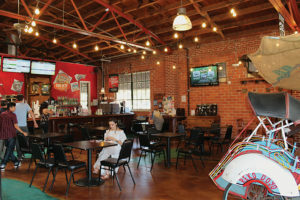 The Iron Fist tasting room on National Avenue within the new Mercado del Barrio apartment and retail complex, serves up locally crafted beers either inside its minimalist walls or on its breezy outdoor patio, just steps from the Chicano Park skate park underneath the east pillars of the Coronado Bridge. The Mercado’s newest tenant is Attitude Brewery, occupying a 5,000-square-foot space in the northwest corner of the building. Owner Kurt Bach plans to hire locals and commission local artists to root his new project in the community. Also within the Mercado del Barrio complex is the popular Mexican seafood restaurant Mariscos el Pulpo. Decorated floor to ceiling with nautical décor, Mariscos offers an array of casual seafood specialties, great fish tacos, and a full bar of tequila and mescal cocktails that you can enjoy on the open air patio or while catching a game on one of the bar’s many flat screen TVs. 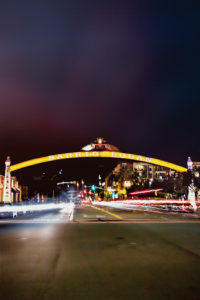 Just across the complex is the bustling Northgate Market, a large grocery story packed with everyday needs and specializing in authentic Mexican foods. 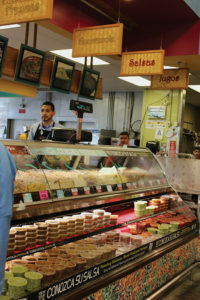 A variety of counters stock marinated meats, fresh-made tortillas, agua frescas, salsas, ceviches, house chips and more. Nestled among all the new is a thriving classic: Las Cuatro Milpas. A Barrio Logan staple since 1935, its walk-up window still draws a regular crowd of San Diegans who swear their tacos are the best in Southern California. Their menu is very limited — think tacos, taquitos, rice and beans — but that doesn’t stop the crowds from lining up and often snaking around the block. As more San Diegans catch a drift of the things happening in Barrio Logan, one thing is certain: rising housing prices. Joel Blumenfeld, a real estate agent with Berkshire Hathaway who has sold multiple homes in the Barrio, said he’s seeing a big influx of young professionals who’ve been priced out of areas like North Park and Downtown, but still want an urban lifestyle. As the demand for housing in the Barrio increases, so do home prices. But, said Blumenfeld, “you can still get a lot of bang for your buck there.” He explained that home prices have increased significantly – in the double digit percentages – in the past five years and that he expects they’ll keep rising. One concern? “With a whole new demographic coming in, there’s a lot of gentrification. Old buildings get torn down for new construction and hipster bars replace some of the culture that’s been there for decades.” Still, the neighborhood seems to be so enmeshed in and dedicated to its heritage that it won’t be easily lost. It’s a fight, in fact, that’s been fought — and won — before. The area became a predominantly residential, Hispanic neighborhood when refugees from the Mexican Revolution flooded into Logan Heights in the early 20th century. In the 1960s the neighborhood took quite a beating with the additions of Interstate 5 and the Highway 75 on-ramp to the Coronado Bridge. More than 5,000 homes were torn down for the bridge’s construction. Disgruntled residents became further angered when they learned the city planned to erect a Highway Patrol facility under the new pillars. Salvador Torres, who lost his childhood home to the construction, along with many other activists staged a 12-day, nonviolent sit-in. Forming human chains to obstruct construction and camping out for two weeks while carrying out negotiations finally resulted in approval for a park, now Chicano Park. Torres had the vision to cover the pillars — then riddled with graffiti — with bright murals celebrating the Latino culture. More than 70 murals — some more than 60 feet high — were created in the years that followed the successful protest. (Torres currently heads the Chicano Park Arts Council.) Today, the pillars of the bridge are a walkable museum of color and culture. Elizabeth Rodriguez, who sells handmade Mexican accessories and décor in her store, Chicanista Boutique on Logan Avenue, said the designation will help property owners see the value in keeping small business owners in the Barrio, and to motivate current and future business owners to stay united in keeping its culture alive and thriving. 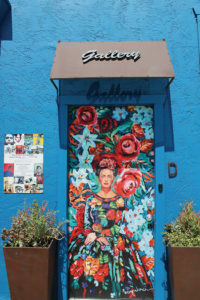 The entry door to Negulescu Fine Art on Main Street captures the colorful, cultural vibe of Barrio Logan. 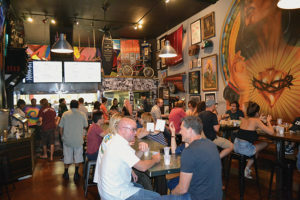 A Saturday night crowd enjoys gourmet tacos and craft beers in the hip Mexican eatery, Salud! 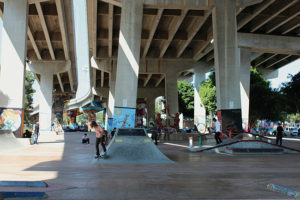 Skateboarders enjoy the ramps built under the pillars of the bridge. 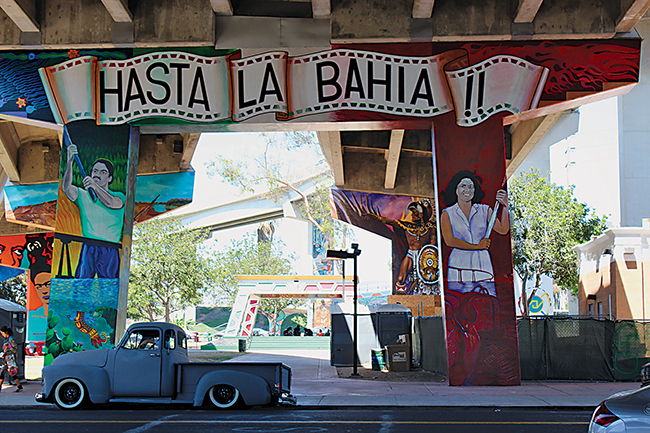 Just under the east side of the Coronado Bridge are more than 70 outdoor murals dating back to the early 1970s. “Hasta La Bahia” means “To the Bay” in Spanish. A colorful tile mosaic adorns a wall in the El Mercado shopping center. 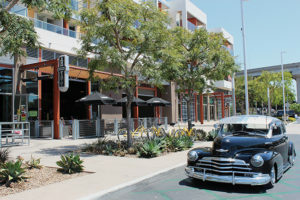 The courtyard at El Mercado on Cesar Chavez parkway overlooks the Barrio Logan neighborhood sign (completed in 2014) and is adjacent to a DecoBike portal where visitors can hop on a rental bike and cruise the neighborhood. Bread & Salt curator and manager Thomas DeMello stands in front of artist Lael Corbin’s exhibit “Thrust Weight Drag Lift” in one of the gallery’s open spaces. The building operated as a bread factory from 1896 to 2006. Brewers and owners of Alta Brewing Co., Brett Stampf and John Bull, opened their tasting room on Julian Avenue in August. 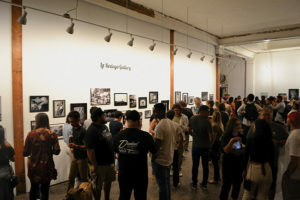 The La Bodega art gallery on Logan Avenue is a popular destination during the Barrio Art Crawl, which takes place on the second Saturday of every month and invites the public to explore the many galleries, eateries and storefronts throughout the neighborhood. 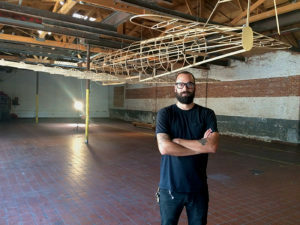 David Reynoso rents a space in the Bread & Salt Gallery, where he’ll be holding performances of his play, “Waking La Llorana” through the winter. 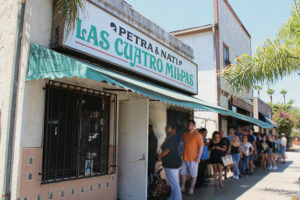 Las Cuatro Milpas on Logan Avenue has a short menu, but usually a very long line. The establishment, which opened in 1935, is in the heart of the Barrio and remains one of San Diego’s most celebrated authentic taco joints. Specialty counters inside The Northgate Market serve authentic, freshly made mexican dishes. The market’s produce section also carries native mexican produce such as tuna, fruits, cactuses and fresh tomatillos. The Ryan Brothers coffee shop opened its doors in Barrio Logan in 2003, long before today’s influx of new businesses. But the family-run operation is still a popular and welcoming destination in the area. 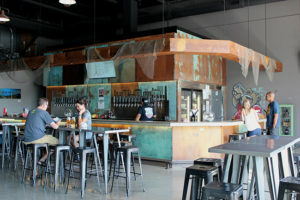 The Iron Fist tasting room in the El Mercado building on Newton Avenue welcomes beer drinkers with a nautical decor and a breezy patio. The streets of the Barrio are often filled with classic cars; the neighborhood is home to many classic car clubs. Owners show off their beautifully kept automobiles at the annual Chicano Park day, which has been running for more than 45 years.